Above: Judging by the children’s clothes, I’d guess this photo must date back to the early 1900s, perhaps even earlier. 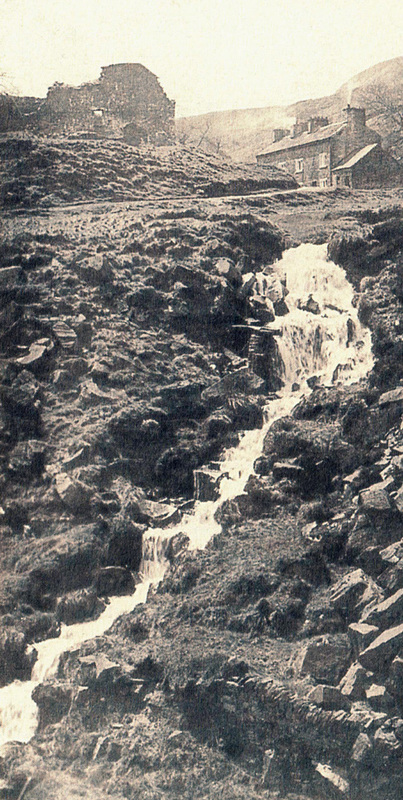 The stream runs down Deep Clough and would have powered the mill. Additional water was provided by a man-made channel which ran across the hillside. The paint mill building would have been behind the rocks on the right. The millworkers’ cottages are in the background. Goytsclough Quarry lies beyond the cottages. Above: Taken from the other side of the Goyt, the paint mill ruins are top left, with the cottages opposite (click to expand) . Above: Another similar view (click to enlarge) of both the paint mill ruins and the cottages in the far distance, but taken from Goytsclough Quarry. The road leads towards Derbyshire Bridge. Above: This 1890 map includes lots of detail on the Paint Mill (click to enlarge). 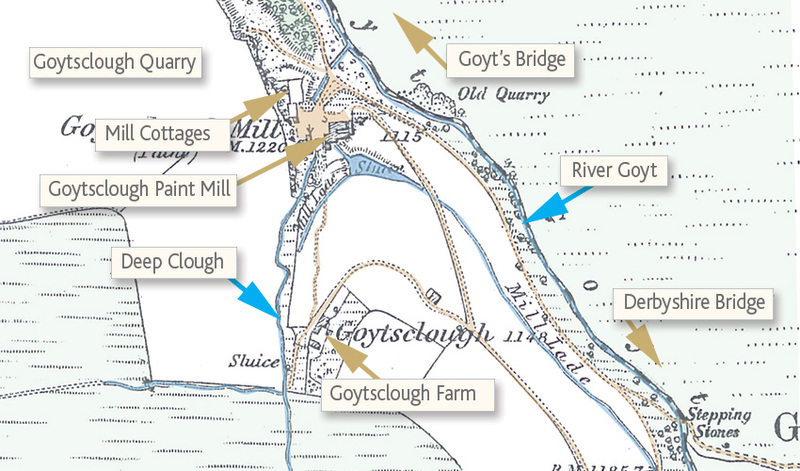 The Goytsclough Paint factory was here until about 1890, employing up to twenty people. Crushed barytes* were made into a powder to be used in the manufacture of paint. This would have been packed in bags and taken by wagon down the valley to be loaded onto the High Peak Railway** where it would reach companies further afield. 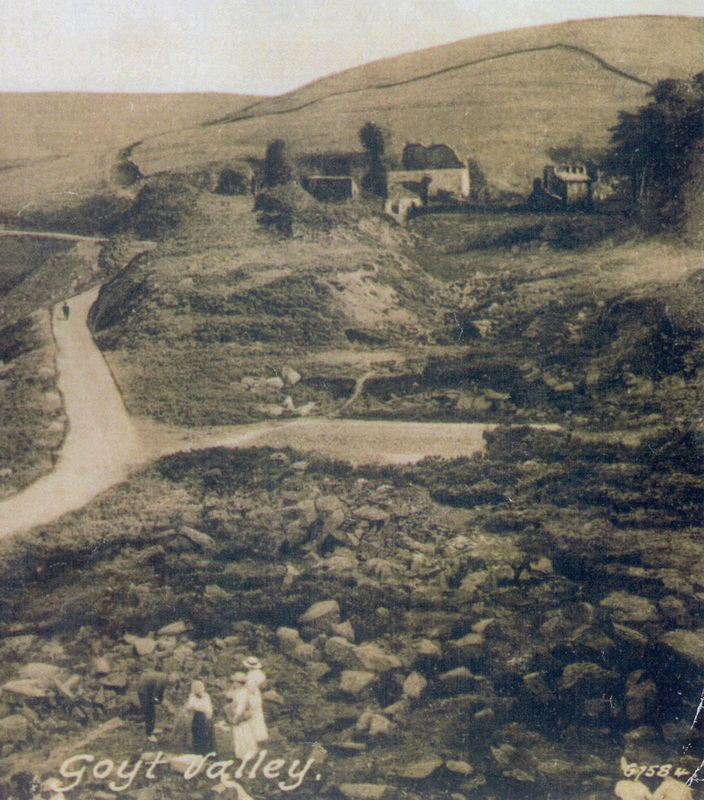 There is still evidence of the four cottages that were here, although small (see photo above), and of Goytsclough Farm, high on the hillside on the left of the clough. The hillside now is shrouded with larch and spruce trees, but a walk up the winding track leads directly to the ruined farm which was quite substantial in its day. Walkers will know this track leads on and upwards to Shining Tor. Several families occupied this hillside farm over the years, the Yeomans in 1861, the Lomases in 1881, and the well known Braddock family after 1891 with their two sons and daughter. Thomas Braddock was a gamekeeper on the Errwood estate. Anyone visiting the site today will find there are virtually no signs of either the factory, or workers’ cottages. It’s only by looking at the map that things start to take shape. A raised rectangle in the ground is all that remains of the cottages. But I can’t find any evidence of the mill itself, which seems to have been built right up to the rock face, which must have formed its rear wall. Water which once powered the millstones still runs down Deep Clough, and there’s a sluice gate further upstream. It’s also possible to make out the Mill Lade – a shallow channel dug into the hillside which provided additional water. *According to Wikepdia, baryte is a mineral which was used in the past as a white pigment for textiles, paper and paint. **The nearest point to reach the High Peak Railway would have been through Goyt’s Bridge to the foot of the Bunsall Incline. The railway ends in Whaley Bridge. From here it would have been loaded onto canal boats heading towards Stockport, Manchester and the Liverpool Docks.